This month’s Daring Bakers Challenge is hosted by Tony Tahhan and MeetaK of What’s for Lunch, Honey? This time around they chose to challenge us with Chocolate Eclairs from the cookbook, Chocolate Desserts By Pierre Hermé . I was excited when I first saw the challenge, I’ve always wanted to make cream puffs but was always intimidated by the Pâte à Choux or Cream Puff dough. I’ve had pretty good results from previous Daring Bakers challenges so I really had high hopes for this one. Unfortunately, it was too good for my winning streak to keep going. So I’m naming this part one because I refuse to give up. I’m definitely making this one again, if only to get it right finally. So here’s the recipe and my notes. I think my dough came together quite well. It was easier than I thought. However, the problem came with the baking time. If I had taken the time to first visit the Daring Baker Forum to read up on what other bakers had run into, I probably would have saved some grief, but I had been very busy and just got around to baking today, the deadline to post. 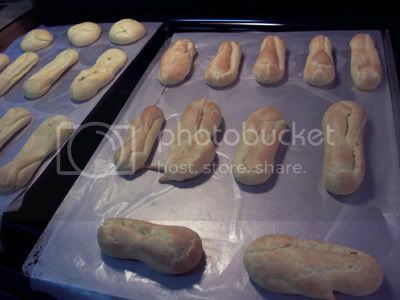 My Notes: if you will note on the photo below, my little puffs looked pretty good coming out of the oven. But if you will note the lighter pastries towards the back, they have already deflated soon after taking them out of the oven. They were pretty thin. I had a feeling they weren’t baked enough at 20 minutes since they were still looking a little pale. So I baked them an additional 5 minutes but I guess that still wasn’t long enough. 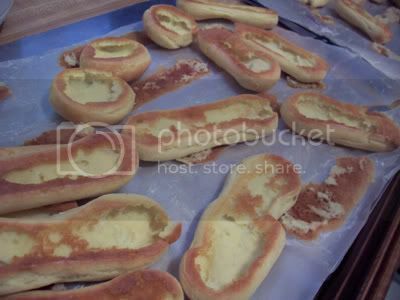 According to our host MeetaK, she had to bake hers an additional 15 minutes in order for the pastry to not collapse. Anyway, soon after pastries came out of the oven and photographed, the phone rang. Second mistake for the day: I answered the phone. Went to the other room to talk, came back to the kitchen about 30 minutes later and realized my pastries were stuck to the wax paper. I should have taken them up from the baking sheet and onto a cooling rack. When I tried to lift them up, the bottoms stayed on the paper leaving a hole at the bottom of each one. I decided to omit the chocolate and added a teaspoon of vanilla extract instead. 1) In a small saucepan, bring the milk to a boil. 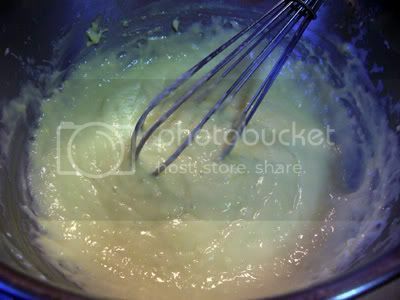 In the meantime, combine the yolks, sugar and cornstarch together and whisk in a heavy bottomed saucepan. 4) Scrape the pastry cream into a small bowl and set it in an ice water bath to stop the cooking process. Make sure to continue stirring the mixture at this point so that it remains smooth. 5) Once the cream has reached a temperature of 140 F remove from the ice?water bath and stir in the butter in three or four installments. Return the cream to the ice?water bath to continue cooling, stirring occasionally, until it has completely cooled. The cream is now ready to use or store in the fridge. 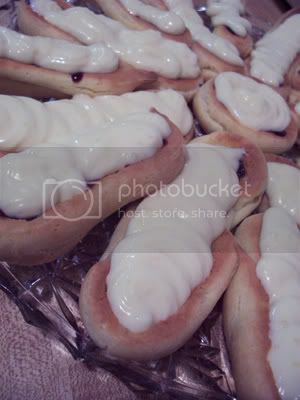 1) The pastry cream can be made 2-3 days in advance and stored in the refrigerator. Since I only had the bottomless pastries, I decided to omit the chocolate sauce to save time and simply melted the bittersweet chocolate in the hot heavy cream and butter mixture. 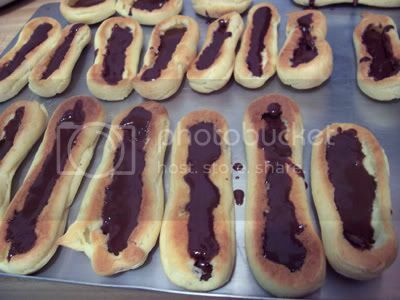 Instead of topping the eclairs with the chocolate glaze, I decided to glaze the bottoms of the pastries with chocolate sauce instead. 1) If the chocolate glaze is too cool (i.e. not liquid enough) you may heat it briefly? in the microwave or over a double boiler. A double boiler is basically a bowl sitting over (not touching) simmering water. 1) Place all the ingredients into a heavy?bottomed saucepan and bring to a boil, making sure to stir constantly. Then reduce the heat to low and continue stirring with a wooden spoon until the sauce thickens. 2) It may take 10?15 minutes for the sauce to thicken, but you will know when it is done when it coats the back of your spoon. So after the bottoming out of my pastries, the assembly instructions kind of went out the window and that’s why the pastry cream is on top rather than between layers of pastry. If you closed your eyes though and just bit into these, you’d think you were biting into some real, true blue eclairs. They were a delicious dessert for tonight. Hey that does not look bad at all! what are u talking about… for a first try it looks pretty good. Will look forward to your second version. YOU are a Daring Baker! Good for you that you pushed on! Nice to see a kabayan daring baker. The eclair still turned out wonderfully. Good thing you didn’t decide to give up. Sorry to read that your eclairs stuck to the wax paper. They still look great! Sorry to hear about your troubles though – very annoying with the deflation.